Liverpool Tickets - Buy your tickets for the Reds online! Book your Liverpool football tickets online through our secure booking system. 1st4footballtickets will bring you a game of one of the most successful football clubs in the world. With a staggering record of eighteen League titles, seven FA Cups, seven League Cups, five Champions League titles, and three UEFA Cups, Liverpool are one of the most successful teams in the history of British football and part of the international football elite. Liverpool has a very loyal fan base, which holds long-standing rivalries with Manchester United and Everton and several other clubs. After finishing eighth in the league last season, Liverpool failed to qualify for this season's European football but the Reds are supposed to be a serious contender for the 2018-2019 Premier League title. Without European football the Reds have their full focus on the Premier League. Their German manager Jurgen Klopp is one of the best managers in the Premier League. The Reds will compete for the Premier League title with Chelsea, Arsenal, Manchester City, Manchester United and Tottenham Hotspur. Buy FC Liverpool tickets now by selecting a Liverpool match below and see world class players like Coutinho and Firmino. We will make sure you will receive your tickets in time to watch the Reds live in action at Anfield. 24 Apr 2019 - Antony G from United Kingdom booked 1 Liverpool vs FC Barcelona football tickets. 24 Apr 2019 - Antony G from United Kingdom booked 1 Liverpool vs Wolverhampton Wanderers football tickets. 24 Apr 2019 - Francis H from United Kingdom booked 3 FA CUP FINAL 2019: Manchester City vs Watford football tickets. 24 Apr 2019 - Morten V from Norway booked 1 Arsenal vs Valencia football tickets. 24 Apr 2019 - RAN F from Israel booked 1 Manchester United vs Chelsea football tickets. 1st4 Football Tickets can provide you with FC Liverpool tickets to all matches at home ground Anfield Road stadium and away including English Premiership, UEFA Europa League and other Liverpool top matches. Browse our site or call our Liverpool Ticket Hotline for Everton v Liverpool, Liverpool vs Everton and more FC Liverpool Tickets. Besides Liverpool tickets for the Premiership, we can also provide you with other Premiership tickets. Liverpool fc supporters don't need Liverpool season tickets to enter the stadium when booking their tickets through our booking system. With our tickets, you can visit a match at Anfield without being season ticket holder. Anfield was originally Everton’s home ground. It’s Liverpool’s stadium since the club was founded in 1892. Anfield is the sixth largest football stadium in England. Liverpool’s stadium has a seating capacity of 54,074. These seats are split between four stand: The Anfield Road end, The Centenary Stand, The Kop and the Main Stand. Anfield is one is of the largest all-seater single stands in European football since the stadium expansion was finished in September 2016. Many people believe Anfield is one of the most beautiful and authentic football stadiums in the world. There is no-one who will be out of Goosebumps when the Red supporters start singing “You’ll never walk Alone”. The entrance of the players at Anfield is one of the most impressive entrances in football. Book your tickets for Anfield safely through our secure online booking system. Anfield was one of the original grounds when the Football League was founded in 1888. Anfield’s home team at that time wasn’t Liverpool, but Everton Fc. 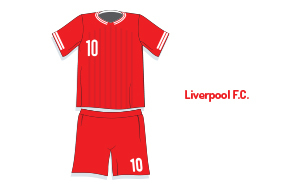 Everton made name for themselves at Anfield winning the 1891 Football League. It was Reverend Chambers and John Houlding who caused Everton Fc to leave Anfield and who created Liverpool Football Club in 1892. Eight years after Liverpool entered the Football League, the Reds won the title. Five years later the title returned at Anfield. Liverpool Fc reached their first FA Cup final in 1914. After several attempts, they finally managed to qualify for the final after beating Aston Villa with 2-0 in the semi-finals. Their first FA Cup final didn’t sort out the way they wanted. Burnley was too strong for Liverpool Fc in this match and so it was Burnley who won the 1914 FA Cup! The Reds needed an extra 51 years to finally win their first FA Cup trophy. In the Final against Leeds United it was goalless for a long time. It was Liverpool who did a better job in extra time. The Reds won the 1965 FA Cup after beating Leeds United with 2-1 in extra time. Eight years after winning their first FA Cup, Liverpool conquered Europe by winning the UEFA Cup. Liverpool produced a combination of outstanding attacking football and resolute defending to claim the first European title in their history at the expense of Borussia Monchengladbach. Liverpool’s famous manager Bull Shankly was determined to make it third time lucky and finally win the first European silverware with Liverpool. He already seen the injustice of a controversial European Cup semi-final defeat in 1965 and the disappointment of an extra-time loss to Dortmund in 1966 for the Cup Winners’ Cup. The UEFA Cup final in 1973 was played in two legs. Liverpool won the first leg at home with 3-0. A 2-0 loss in the second leg was just enough for Liverpool to win their first big European trophy. Four years later they also won the biggest trophy in European club football: the European Cup! Once again in a final against Borussia Monchengladbach. Liverpool is a serious title contender in this season with Jurgen Klopp at the helm. The German manager proved he can built a title worthy team. He even managed to win the Bundesliga over Bayern Munich two consecutive times. At the same time, he reached the Champions League final with Borussia Dortmund. Klopp is in Liverpool since the club sacked Brendan Rogers in October 2015. His first year was tough, but this summer he had every chance to build his own squad. Liverpool bought some very strong players which can help bringing the Premier League title back to the Merseyside. Sadio Mane, Mo Salah, Roberto Firmino, Naby Keita and Georginio Wijnaldum are some of the best players in the Premier League. They should be able to play for the title this season. Liverpool does need your support if they want to win the title. So, book your Liverpool tickets securely online through our booking system and watch the Reds live at Anfield. A football club with such a big trophy cabinet must have some big legends. There is a big list with former Liverpool players who had a big impact on the club. Liverpool’s latest legendary player is of course Steven Gerrard. Stevie G is one of the best players Liverpool ever had. The fans love him not only for his skills but also for his loyalty to the club. In an era where Liverpool wasn’t a candidate for Premier League title he always kept loyal to his club. Gerrard always rejected offers from teams like Bayern Munich and Real Madrid. It was his big dream to win the Premier League with Liverpool, so he stayed for 17 years at Anfield. In this 17 years, he made 710 first team appearances for his club. Although he never won the Premier League, he did win the Champions League in 2005. He is third in the ranking with players who played the most matches for Liverpool. Steven Gerrard’s former teammate Jamie Carragher is second on this list with 737 appearances. Ian Callaghan is by far the player with the most first team appearances. He played 857 matches for Liverpool between 1960 and 1978. Ian Rush is the biggest goal scorer in the history of Liverpool. The Welsh striker scored 346 goals in 660 appearances for the club. Roger Hunt is on the second place with 286 goals, Gordon Hodgson third with 241 goals, Billy Liddell fourth with 228 goals and Steven Gerrard closes the top 5 with 186 goals. Sadio Mane is Liverpool’s most expensive player. In the summer of 2016 Liverpool paid 36 million GBP to Southampton for this Senegalese forward player. Andy Carroll is second on this list with a transfer fee of 35 million GBP and Christian Benteke comes on the third spot with 32,5 million GBP. Luis Suarez is the player which Liverpool received the highest transfer fee for. The Reds sold Suarez in 2014 for 75 million GBP to Fc Barcelona. Fernando Torres is second on this list with a transfer fee of 50 million GBP and Raheem Sterling comes in third with a transfer fee of 49 million GBP. Bill Shankly is Liverpool’s longest-serving manager by matches. He served Liverpool for 783 matches between 1959 and 1974. In this time, he was responsible for the first FA Cup trophy and European successes for his club. Fans bought their Liverpool Fc tickets sometimes just to see their price winning manager. Shankly collected eleven trophies for Liverpool Fc. There is only one manager who won more trophies with the club. Shankly’s successor Bob Paisley came to Liverpool in 1974 after Shankly’s resignation. It was his job to build further on Shankly’s solid foundation. Paisley won 20 trophies with the Reds, including 6 league titles and 3 European cups. Liverpool has two serious rivals. Their neighbours Everton Fc are their first big rivals. Anfield and Goodison Park aren’t even a mile apart from each other. The match between these two Merseyside teams is called the Merseyside Derby. In the past, this match was referred to as the Friendly derby. Many families with both Everton and Liverpool supporter watched the match together at the stadium. The rivalry between these teams intensified since the mid-80’s. Both on and off the pitch things got more intense between Liverpool and Everton. Nowadays the Merseyside Derby is often referred to as: "The most ill-disciplined and explosive fixture in the Premier League”. Older Liverpool fans would say Manchester United is their biggest rival. Liverpool versus Manchester United is called the North-West derby and is considered the most famous fixture in English football. The rivalry between these two teams is for both bigger than the rivalry with their neighbours. Liverpool and Manchester United are two of the most successful English teams in domestic and European football. Liverpool football tickets for this match are high demanded in these days. The rivalry has been fuelled by the proximity of the two cities they represent. The North-West Derby isn’t just Liverpool Fc versus Manchester United, but it’s at the same time Liverpool versus Manchester. Are you looking to visit a Liverpool match at Anfield? You’re at the right place! 1st4Footballtickets makes it very easy for you to book your tickets through our secure booking system! Follow these steps to book your Liverpool tickets! After completing your order, we will forward your order to our reseller. Our resellers will make sure you will receive your Liverpool football tickets in time before the match. All our ticket orders are 150% guaranteed. We have a completely secured booking system so all your ticket orders are fully secured. You can always contact us by email of through the chat service on our site for all your questions. 1st4 Football Tickets.com • Copyright 2004-2019 • All Rights Reseved.